A historic streak from the Southern Dolphins ended Saturday evening as the FD Friars made history of their own as the Friars downed the Dolphins 39-0 at the GW Field. FD extends their total win streak to 36 games, capturing a league best (6-0) record after Saturday’s win. The Dolphins lose for just the first time since opening week, holding a school best (3-2) record with just one week left before playoffs. Friar running back Kein Artero tore up the field, needing just 13 carries for 149 yards and two scores. Artero’s day was done at the half for the second straight week as the leading candidate for offensive MVP (not official) was kept without a touch in the second half. Friar quarterback Nick Anderson tossed two touchdowns completing 5-of-11 passes for 67 yards. Catching Anderson’s touchdown tosses were Josh Calvo from 10 yards out and Davin Rojas from 21 yards out both in the second quarter. The windy evening affected the Friars passing game, but once Anderson made the adjustments, it was smooth sailing. 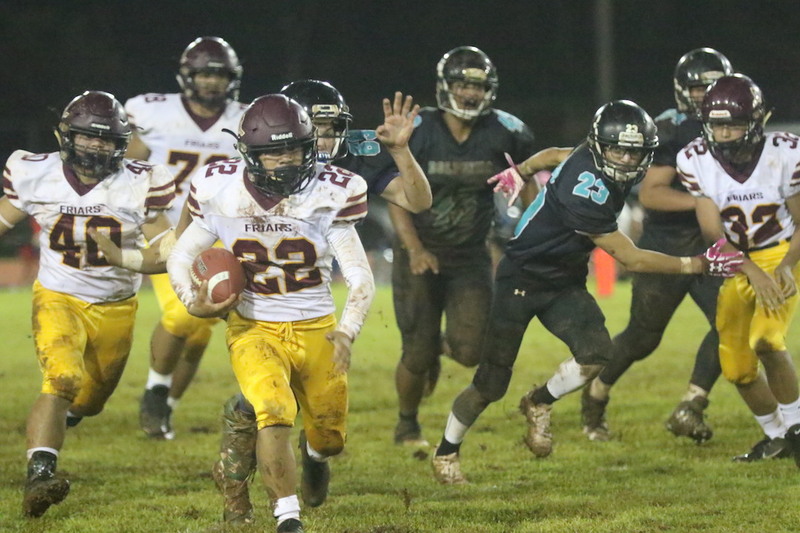 The Friar defense rallied behind the injury of All-Island defensive back Noah Diaz, who exited the game in the 1st quarter with a dislocated elbow. Diaz went diving for an interception and landed directly on his elbow. After getting taped up by the Friar medical staff, Diaz was transported via ambulance to the hospital. “Everything we did was for Noah. We huddled up, said a little prayer and started doing it all for Noah, Xavier and Mr. Thompson,” said linebacker Roy Chargualaf. The freshman Chargualaf had himself a game, leading the team with 11 tackles against a Dolphins team he is very familiar with since Roy is a Southern boy himself. Fellow freshman Evan Brown had six tackles, a forced fumble and a sack to showcase the young rising talent the Friar defense has. The Friars were held up on their opening drive with the Dolphin defense getting a sack on Anderson on 4th and five on the Southern 28. The Friar defense stopped the Dolphins from getting back to midfield to force a three-and-out which set up the first FD score. Artero took a toss play to the left side of the defense before powering inside the end zone for an 11-yard score. FD’s defense then sacked Southern’s Ethaniel Escuadra on 3rd down to force another punt, this time leading to a 10-yard score from Caiyle Gogue, who’s making his return to the team after a two week injury absence. FD’s two running touchdowns, but failed PAT’s had the Friars up 12-0 after one. The Friars went airborne as Anderson hooked up with Calvo for a 10-yard score to go up 19-0 with Robert Haddock converting the PAT. Artero’s last touch for the night ended in a 23-yard touchdown up the gut to out FD up 25-0. FD’s Brown punched the ball loose on a gang tackle and the Friars would recover to set up a quick score right before halftime as Anderson connected with Rojas from 21 yards out to give FD a comfortable 32-0 lead. FD’s Christian Taitano punched in the final score from three yards out to final the game 39-0. The Friars will end their regular season against the Tiyan Titans next weekend while the Dolphins will play the Guam High Panthers for a battle for 3rd place.